"... answers any question that a criminal defense attorney could have ... and ... answers those same questions for the defendant in plain and simple language. ... an excellent guide for any attorney regardless of their experience ... every criminal defense attorney should have this book"
Read also "How Busted Helped Me", a real life defendant relates his encounter with 'the minefield of justice' (his words). The new 2019 19th Edition is now available! It continues to serve defendants arrested on federal charges. Busted by the Feds is the gold standard for technical information, points about the law and clear communication par excellence. It's about time to give hope and reunite families. Defendants as well as their families, loved ones, attorneys and ordinary citizens should read this book. This is the most important book ever written for the Federal defendant. 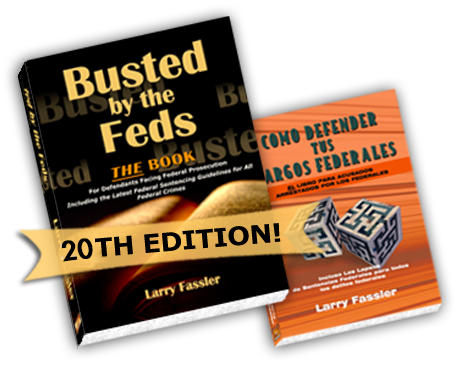 Busted by the Feds is the classic source for the help you need with your defense. It covers everything from the time of your arrest, through bail, plea bargaining, going to trial or pleading out, and sentencing. It also includes essential material on the Bureau of Prisons policies that will affect you if you are eventually incarcerated. Busted also includes the Federal Sentencing Guidelines for all federal offenses. Plus in depth explanations of how the guidelines work in specific cases: the base offense levels, as well as aggravating and mitigating factors and possible upward or downward departures. There is extensive consideration of the now-advisory nature of the Guidelines since the Booker decision in 2005 and the subsequent decisions by the Supreme Court in Rita, Kimbrough, Gall and Nelson. These subjects, which can be of great importance in obtaining a lesser sentence, are explained in a clear and easy-to-understand way. The Booker chapter, under the section More Practical Advice, contains 50 examples of areas where a downward variation can be obtained in specific cases. A downward variation can potentially save a defendant years of incarceration, and you could be that defendant. The new NINETEENTH Edition contains the most up-to-date information, including the latest list of all Bureau of Prisons institutions, the current list of countries with Prisoner Exchange Treaties with the United States, current information on changes in Bureau of Prisons policies, and important legal decisions this last year by the Federal Courts that can effect a defendant’s defense. Finally, the Nineteenth Edition contains critical information from THE FIRST STEP ACT, the recent legislation passed by Congress that offers new relief to federal defendants and inmates. If you are a defendant or the family member of a defendant, or a defense lawyer in the federal system, you need this book. Continue through this site to see the wealth of material Busted contains and the new information in this NINETEENTH Edition.